Okay, all you prolific singer-songwriters, how about knocking out 26 tunes, including some timeless classics, in 30 days? That’s what Woody Guthrie did in the spring of 1941. And even though the tunes had somewhat mercenary roots — he was commissioned to write them by and about Portland, Oregon’s Bonneville Power Administration who were building dams along the Columbia River — he only got about ten bucks per track (not even much back then). The results were uniquely Guthrie stamped. 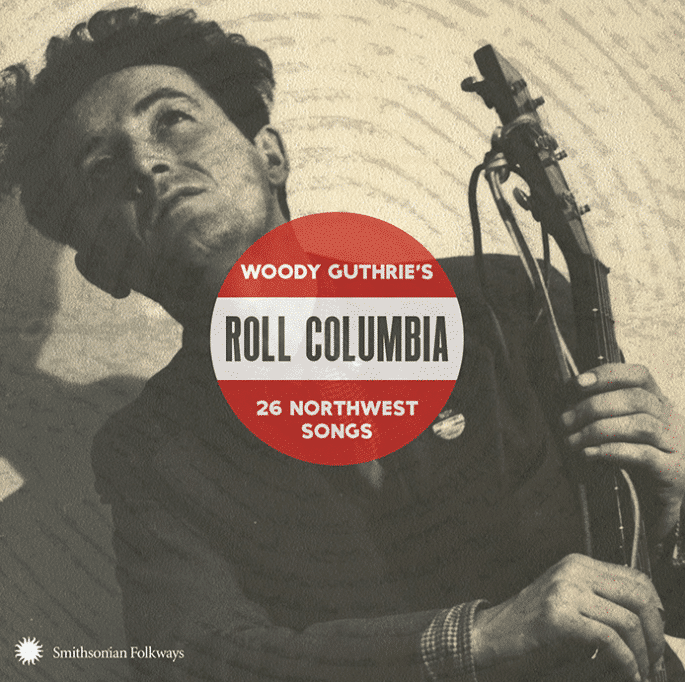 In fact some such as “Pastures of Plenty” and “Roll On, Columbia, Roll On” (the official folk song of Washington State) have become landmarks in a bulging catalog that chronicles his bold and often uplifting, always politically and socially aware vision of America. The 17 songs originating from this month-long burst have already been gathered and released on Rounder’s 1988’s Columbia River Collection. But this beautifully collated and immaculately researched and annotated double disc of covers reveals nine more not recorded by Guthrie, yet written during that fruitful time. Add a few repeats to those 26 and the 28 cut, 104 minute set stands as the last word chronicling Guthrie’s work during this period. Executive producers Joe Seamons and Bill Murlin (both also contribute to the music) do a superb job assembling these somewhat obscure offerings. And even if the set — which includes contributions from such ringers as Peter Buck and Scott McCaughey (from the Minus 5), Tony Furtado and David Grisman — is low on high-wattage star power, these mostly acoustic, stripped-down versions are uniformly respectful and performed with a knowledge and understanding of Guthrie’s resolve. Most follow his lead in arrangements although the instrumentation is bolstered slightly to include occasional fiddle, banjo, bass and, in the case of “New Found Land,” even organ. The generally male cast is interrupted a few times by women interpreters. The most stunning is a sweet “Mister Sandman”-styled lullaby vocal trio led by Annalisa Tornfelt on the uniquely titled “Eleckatricity and All,” a love song to a suitor who will bring her electricity as part of the “happily ever after” scenario. Caitlin Belem Romtvedt’s hillbilly “Columbia’s Waters” takes a hoedown, sprightly Acadian backwoods approach with a voice as clear and crisp as the titular river. While no one would consider Guthrie the father of hip-hop, in the fast talking “Columbia Talkin’ Blues” and the related “The Talkin’ Blues,” there are roots to what Dylan turned into “Talkin’ New York” on his debut, and a sense that the rap concept was around long before its late-’70s/’80s urban heyday. Even on some of the most liberal readings and with the contemporary audio approach, this remains folk music in its purest form. These covers help bring the musty material alive to a new generation, free from the tinny recordings that, until now, were the only way many were heard. The package documents a fascinating and important chapter in the history of one of America’s most iconic folk singers. This affectionately assembled collection, with its comprehensive 44-page book detailing both the song and its performer to provide historical perspective, is a beautifully realized and important tribute to Guthrie and his work during this brief but influential creative stretch.